However, is this chart really telling the whole story? After all, the House of Representatives proposes and ultimately controls federal spending, not the president. So, why would Pelosi's office put out a chart based around the presidents? This chart is structured like Pelosi's chart. The major difference is that we’ve highlighted Congress since 1981, instead of the presidency. Of those sixteen Congresses, Democrats controlled the House nine times while Republicans controlled it seven times. While in power, the Democrats dramatically outspent the Republicans. The 471% increase in the debt during 18 years of Democratic control is staggeringly more than the 105% increase during 14 years of Republican control. Consider the contrasting stories told by these two charts. 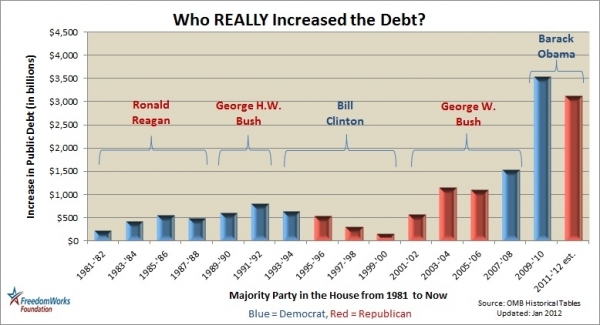 Pelosi's office is telling a fairy tale that places the blame for an exploding debt squarely on Republican presidents, especially Reagan and George W. Bush. 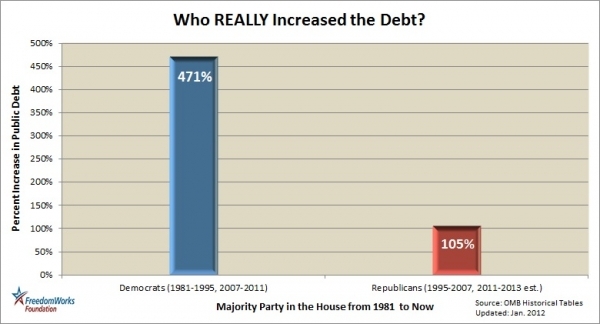 However, reality provides a very different account: It was Democrats controlling the House that swelled the debt. Presidents don’t hold the “purse-strings” of government, only the veto power. Nancy Pelosi’s chart is simply deceptive. Undoubtedly, many readers will correctly argue that both percentages are far too large and that both parties are to blame for profligate spending in Washington. It’s helpful to look at each individual Congress. It reveals that overspending is indeed a bipartisan problem, particularly during the last ten years. 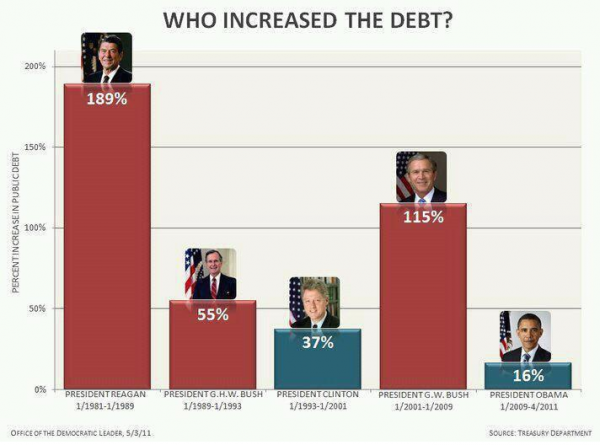 The stunning rise in the national debt since 2000 occurred under both Republican and Democratic leadership in the House and the presidency. Neither party can claim a spotless record with regard to deficit spending and debt creation. Still, the degree to which the Democrats in Congress under President Obama’s leadership have engaged in both of these practices is frightening. The federal government will default on its debts if the public does not force those in power to cut back spending. The chart put out by Nancy Pelosi's office is not only misleading in its attempt to shift away blame, it also misses the larger point. Our focus must be aimed directly at addressing the debt in a serious and lasting manner. The grassroots-generated Tea Party Budget is a realistic, significant effort to accomplish just that by cutting spending by $9.7 trillion dollars over the next ten years and balancing the budget in four years. If you would like to learn more about the Tea Party Budget, here is the link. To reduce debt what we really need is to cut spending, not to increase revenue. You know the Democrats are not serious about reducing the debt or raising taxes when Kay Hagan (D) put forth the "Computer Professionals Update Act" which denies I.T. Workers Overtime pay and therefore reducing the amount of taxes paid to the treasury. Every move these politicians make do nothing but harm this country more. I am truly sorry but Budget Cuts are a fool’s errand; the ultimate PIPE DREAM! “Budget Cuts” are nothing more than giving the tyrants and usurpers the power to choose the cronies and the losers. They are, therefore, politically impossible! The losers, such as the two worst ILLEGAL unsustainable Ponzi schemes of Socialist Security and Medi-scare, for just two examples amongst thousands, won’t stand for it. These two special interest groups have long been played the patsy and been crony favorites of politicians seeking to keep their cushy $174,000.00 jobs with stock market, health care, pension and numerous perks up the wazoo. The answer, however, is simple. Not easy, but simple. The solution is for a critical mass of people to unite in one voice to compel the U.S. Government to fully respect and obey, word for word, the canons of The Declaration of Independence and its dovetail legal document The Constitution, per the definition of the terms “General Welfare”, “Regulate” in the commerce clause and the “as necessary and proper” clause as legally defined in documentation as penned by the hands of the Founding Fathers, such as Federalist #41 as just one of many examples. All three of these terms legally mean, in spirit and intent well documented, the opposite of what we have been led to believe by tyrants and usurpers in all three branches of the contemptuous Federal Government, starting in the 1800s already, such as the infamous so called “elastic clause” of 1824 by the “Midnight Judges” of John Adams who turned against his own beliefs with regards to freedom, liberty and individual Rights and the reason for the termination of the friendship between him and Thomas Jefferson. He himself called for “THE RULE OF LAW, NOT MEN”, but once drunk on power over people his “fallen nature” of man overcame him as happens with so many well meaning freshmen who are “co-opted” as Republican Trent Lott has stated about what they were going to do with the TEA Party freshmen. Now if the Federal Government is compelled BY THE RULE OF LAW, NOT MEN to obey The Constitution, word for word, per the definition of terms by The Founding Fathers, and so they are only allowed to do eighteen enumerated things plus the military and the courts, than what do they need all of the money that they don’t get from us in income taxes? According to the 1916 Supreme Court the 1913 ratification (of the NON-ratified) 16th Amendment (disingenuously tallied by the despicable Secretary of State Philander Knox under the tutelage of Socialist-in-Chief Woodrow Wilson, the apportionment clause of tax on direct labor is still in full force and affect, in that it was stated that anybody who wasn’t taxable before the 16th Amendment isn’t taxable after it. Okay, now think about this - - - if all of those Trillions are left on our paychecks and in our economy and, they are “real” money for a change, not “Federal Reserve NOTES” which are “NOTES” (nothing more than “the promise to pay” with “real” money at some point in the future or upon redemption by the bearer, in our contemporary case backed by almost totally NOTHING to redeem and thus nothing more than the ghost of money as stated by Thomas Jefferson and thus subject to total collapse in hyperinflation), then think how fast our country could grow in the ether of Freedom and individual Rights and security of our property from them. Additionally and most importantly our fellow countrymen would worship and pray to our Creator for our needs not The Federal Government, the Almighty Lord who delivered our world Super Power Colonial Government into our pitchfork and musket holding hands, surely by His Grace alone. With the Law of Righteousness and Divine Providence on our side, my dear fellow countrymen, I ask, how can we loose? Tipical Democrats, one lie after another. The debt and deficit are too high because the government spends too much, not because the revenue are too low.